Fuji Speedway (富士スピードウェイ, Fuji Supīdowei) is a motorsport race track standing in the foothills of Mount Fuji, in Oyama, Suntō District, Shizuoka Prefecture, Japan. It was built in the early 1960s. In the 1980s, Fuji Speedway was used for the FIA World Sportscar Championship and national racing. Originally managed by Mitsubishi Estate Co., Fuji Speedway was acquired by Toyota Motor Corporation in 2000. The circuit hosted the Formula One Japanese Grand Prix in 2007, after an absence of 30 years, replacing the Suzuka Circuit, owned by Honda. After Fuji Speedway hosted the 2008 race, the Japanese Grand Prix returned to Suzuka for the 2009-onward races. The Super GT Fuji 500 km race is held at the racetrack on Golden Week. Fuji Speedway has one of the longest straights in motorsport tracks, at 1.475 km (0.917 mi) in length. The circuit has FIA Grade 1 license. Fuji Speedway Corporation was established in 1963, as Japan NASCAR Corporation. At first, the circuit was planned to hold NASCAR-style races in Japan. Therefore, the track was originally designed to be a 4 km (2.5 mi) high-banked superspeedway, but there was not enough money to complete the project and thus only one of the bankings was ever designed. Mitsubishi Estate Co. invested in the circuit and took over the reins of management in October 1965. In 1969 I spent two months in Japan doing a test contract for Toyota and their Toyota 7 (5 litre V-8), which along with a big Nissan (6.3 litre V-12), was destined for CanAm. My last testing and then the subsequent Sports Car GP were at Fuji, but the track was run in a clockwise direction. The reason that banking was so horrific, was that at the end of the straight we went over a blind crest at around 190/200 mph and dropped into the banking. At other tracks (Daytona, Montlhéry, etc.) you climb up the banking. One of the results was that although there were many brave Japanese drivers there were not too many with great skill and the death toll from that one corner was horrendous. To such an extent that the big Gp 7 cars were then banned in Japan and thus, neither Nissan or Toyota ever made it to CanAm. After a double fatal accident in 1974 on the Daiichi banking where drivers Hiroshi Kazato and Seiichi Suzuki were both killed in a fiery accident that injured 6 other people, a new part of track was built to counteract the problem, and the resultant 4.359 km (2.709 mi) course which also eliminated 5 other fast corners proved more successful. In 1966, the track hosted a USAC Indy Car non-championship race, won by Jackie Stewart. The track had a 24-hour race in 1967. The speedway brought the first Formula One race to Japan at the end of the 1976 season. The race had a dramatic World Championship battle between James Hunt and Niki Lauda, and in awful rainy conditions, Hunt earned enough points to win the title. Mario Andretti won the race, with Lauda withdrawing due to the dangerous conditions. In 1977, Gilles Villeneuve was involved in a crash that killed two spectators on the side of the track, leading to Formula One leaving the speedway. When Japan earned another race on the F1 schedule ten years later, it went to Suzuka instead. The Grand Prix returned to Fuji in 2007. Fuji remained a popular sports car racing venue and FIA World Sportscar Championship visited the track between 1982–1988 and it was often used for national races. Speeds continued to be very high, and two chicanes were added to the track, one just past the first hairpin corner, the second at the entry to the very long, very fast final turn (300R). But even with these changes the main feature of the track remained its approximately 1.5 km (0.93 mi) long straight, one of the longest in all of motorsports. The long pit straight has also been utilised for drag racing. NHRA exhibitions were run in 1989, and in 1993 Shirley Muldowney ran a 5.30 on the quarter-mile strip at Fuji. Local drag races are common on the circuit. The track continues to be used for Japanese national races, but plans to host a CART event in 1991 were abandoned and it was not until the autumn of 2000 that the majority of the stocks of the track was bought by Toyota from Mitsubishi Estate, as part of its motor racing plans for the future. On May 3, 1998 there was a multi-car crash during a parade lap before a JGTC race, caused by a pace car going at twice the recommended speed in torrential rain. Ferrari driver Tetsuya Ota suffered serious burns over his entire body after being trapped in his car for almost 90 seconds. Porsche driver Tomohiko Sunako fractured his right leg. In 2003 the circuit was closed down to accommodate a major reprofiling of the track, using a new design from Hermann Tilke. The track was reopened on April 10, 2005. The circuit hosted its first Formula One championship event in 29 years on September 30, 2007. In circumstances similar to Fuji's first Grand Prix in 1976, the race was run in heavy rain and mist and the first 19 laps were run under the safety car, in a race won by Lewis Hamilton. The circuit has always hosted the NISMO Festival for historic Nissan racers, since the takeover and refurbishment in 2003, the event took place at TI Circuit. When the festival returned in 2005, the organisers allowed the circuit owner to bring in their Toyota 7 CanAm racer to re-enact the old Japanese GP battle. Toyota also hosts its own historic event a week before the NISMO festival called Toyota Motorsports Festival. Close to the circuit is a drifting course, which was built as part of the refurbishment under the supervision of "Drift King" Keiichi Tsuchiya. The short course nearby was built under the supervision of former works driver and Super GT team manager Masanori Sekiya and there is a Toyota Safety Education Center, a mini circuit. In addition to motorsports, Fuji also hosts the Udo Music Festival. The only time the circuit is run on a reverse direction is during the D1 Grand Prix round as Keiichi Tsuchiya felt the new layout meant reduced entry speed, making it less suitable for drifting. The series has hosted its rounds since 2003, with the exception of the 2004 closure, the circuit became the first to take place on an international level racetrack and the first of the three to take place on an F1 circuit. The course starts from the 300R section, slide through the hairpin, then through 100R and ends past the Coca-Cola curve. With the reprofiling, as cars no longer run downbank, entry speeds have since been reduced, the hill at the exit making acceleration difficult. As part of the 2003 renovations, most of the old banked section of track was demolished. Only a small section remains to this day. Following both poor ticket sales and weather it was decided by FOM that the FIA Japanese Grand Prix would be shared between Fuji Speedway and Suzuka on alternate years with Suzuka holding the next race on Sunday, October 4, 2009. After the global recession and its own operational deficit, Toyota decided to discontinue the hosting of Japanese Grand Prix since 2010. Fuji Speedway was announced to host the finish of the road cycling races at the 2020 Summer Olympics. This is the official listing of the twelve corners that make up the current circuit layout, in use since 2005. Only some corners have Japanese names, most of which are a result of sponsorship agreements. The rest are named after the radius of the corner in meters. The Dunlop corner differs with the configuration used. In the full configuration, it consists of a tight right hairpin turn followed by a left-right flick. In the GT course it is a medium speed right-hander, bypassing turns 11 and 12. The Fuji circuit is represented in the arcade racing game Pole Position. Fuji is also featured in Project CARS 2, Top Gear, TOCA Race Driver, Gran Turismo 4: Prologue, Gran Turismo 4, Gran Turismo 5: Prologue, Gran Turismo (PSP), Gran Turismo 5, Gran Turismo 6 and Gran Turismo Sport. For F1 Challenge '99–'02, Grand Prix Legends, rFactor, GTR 2 – FIA GT Racing Game, GT Legends and Race 07 the track is available as free downloadable add-on. The Fuji circuit is featured prominently in the Japanese television drama Engine as the main setting for the racing scenes, as well as the home of the (fictional) "Regulus Cup". The track was also featured in an episode of the 11th season of the British automotive show Top Gear in which host Jeremy Clarkson takes a Nissan GT-R through its paces. Part of the Gaki no Tsukai 2013 New Year's Holiday No-Laughing Earth Defense Force punishment game was also shot at Fuji Speedway. The circuit was featured in the opening scene of tokusatsu series Dennou Keisatsu Cybercop. During the 2007 Japanese Grand Prix, Fuji Speedway met with a lot of problems such as the paralysis of the transportation network provided by the shuttle buses, poor facilities including some reserved seats without a view, lack of organization, and expensive meals that meant a simple lunch-box was sold for 10,000 yen (US$87) at the circuit. Newspaper accounts of the event also alleged problems with Toyota bias and control. During the 2007 Japanese Grand Prix, the circuit prohibited the spectators from setting up the flags and banners to support the teams and drivers, with the exception of the Toyota F1 team whose owner also owned the circuit. Therefore, there were very few flags and banners in the event compared with other Grand Prix events. For the 2008 Japanese Grand Prix race, organizers responded to lessons learned the previous year by reducing the total number of spectators allowed at the event. Compared to 140,000 persons allowed for Sunday events in 2007, attendance was restricted to 110,000. Additionally, walkways and spectator facilities were improved, along with larger screens. However, the race was also affected by rainy weather, which has historically interfered in a number of past races at the circuit, and later in 2013, led to interference with a 6-hour endurance race at the track for the FIA World Endurance Championship. ^ service, Grandprix.com – First & fastest: The original online F1 news. "Grandprix.com". grandprix.com. Retrieved June 29, 2016. ^ "Fuji: Duval, Couto weekend summary". motorsport.com. Archived from the original on June 7, 2011. Retrieved June 29, 2016. ^ "LIST OF FIA LICENSED CIRCUITS" (PDF). FIA. February 6, 2015. Retrieved May 28, 2015. ^ "1967 Toyota 2000 GT". conceptcarz.com. Retrieved June 29, 2016. ^ "Suzuka responds to Fuji pressure". grandprix.com. December 23, 2000. Retrieved November 18, 2016. ^ a b "Super GT: AUTOBACS CUP GT Championship 1998 Round 2 – Race Review, Fog Bank Ends 2nd Round of GTC". Archived from the original on June 5, 2011. Retrieved December 25, 2009. ^ a b The chicanes were added in 1984 and 1987. ^ "1992 AJTCC – round 8". touringcarracing.net. Retrieved June 29, 2016. ^ "富士スピードウェイ：コース見えず、トイレやバスは大渋滞　３０年ぶりＦ１に課題 (Fuji Speedway: Can't see the course, and the rest rooms and the shuttle buses are crowded. There is a problem in F1 has not held for 30 years)" (in Japanese). Mainichi Shimbun. October 1, 2007. Archived from the original on October 11, 2007. Retrieved October 3, 2007. 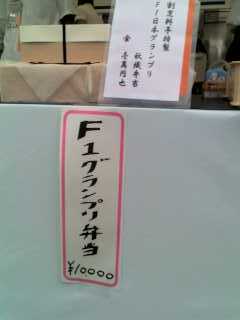 ^ "F1 Grand Prix lunch-box – \10,000". www.kansenzyuku.com/. September 28, 2007. Archived from the original on August 24, 2008. Retrieved October 3, 2007. ^ "Notes on the reserved seat" (in Japanese). kansenzyuku.com. September 28, 2007. Archived from the original on August 24, 2008. Retrieved September 30, 2007. ^ "日本ＧＰ・横断幕の事 (About banners at the Japanese GP: Q&A with Mr. Ikeya, Fuji Speedway)" (in Japanese). champion-ship. October 1, 2007. Retrieved October 1, 2007. ^ "Captured image from the race on Sunday" (in Japanese). Formula One Administration. September 30, 2007. Retrieved September 30, 2007. ^ "Kenji Sawada's Report from circuit" (in Japanese). Kenji Sawada, an official F1 photographer. September 30, 2007. Archived from the original on October 13, 2007. Retrieved September 30, 2007. ^ "Fuji to limit attendance for 2008 GP". f1update.com. Retrieved June 29, 2016. ^ "Fuji gets better toilets but still needs a roof · F1 Fanatic". f1fanatic.co.uk. February 20, 2008. Retrieved June 29, 2016. Wikimedia Commons has media related to Fuji Speedway. This page was last edited on 22 March 2019, at 06:21 (UTC).